From Interstate Highway 5 Southbound: Take the Oak Street/Fremont Street exit. Turn left onto Fremont Street. Continue on Fremont Street. Ballpark is on the right at the corner of Fremont Street and Lincoln Street. From Interstate Highway 5 Northbound: Take the Pershing Avenue exit. Make an immediate right onto Flora Street. Turn right onto Orange Street. Turn left onto Fremont Street. Ballpark is on the right at the corner or Fremont Street and Lincoln Street. From Highway 99: Exit Highway 4 (Cross-town Freeway) heading West. Travel to downtown Stockton and exit El Dorado Street. Travel North on El Dorado four blocks. Turn left on Fremont Street. Ballpark is on the left at the corner of Fremont Street and Van Buren Street. Parking at Banner Island Ballpark is only $5 per spot. For information on the Downtown Trolley Loop, please contact RTD at 209.943.1111 or 1-800-HOW-TO-RIDE (1.800.469.8674) or visit http://www.sanjoaquinrtd.com/maps_and_schedules/Route40.php. To download an easily printable version of the route map and schedule information visit the Downtown Stockton Alliance at www.downtownstockton.org or stop in at 306 East Main Street, Suite 200-A. The Stockton Ports are proud to announce that the Stockton Downtown Marina is now open and that fans for the first time take their boat to the game! Fans can take advantage of the public dock on the North Shore behind the ballpark all season long! There are two guest docks which include a combined 878 linear feet of dock for boats on the North Shore! 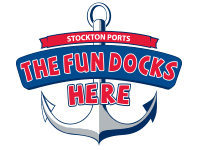 For all 70 Ports home games, the Stockton Downtown Marina will be accessible for boaters to dock for the game, or overnight. Docking at the public Stockton Downtown Marina costs $10/Game or $30/Overnight. To dock at the Downtown Stockton Marina, contact Westrec Marina Management, Inc. at (209) 462-4200 the number and sizes of boats, and dates of your visit. Long term berthing info also available.